Hello to all of you wonderful people following the divergent path of diabetes management!! I have another great deal for you on low carb swag. I would never ordinarily post a promotion right after a product review, but this just came to my inbox this morning and it's too good to delay. 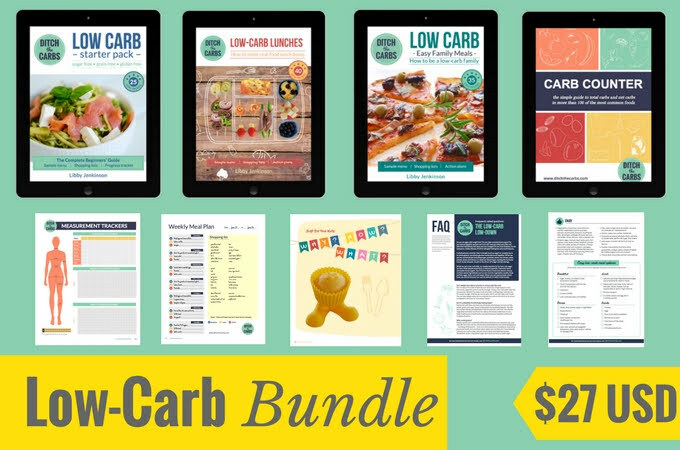 Ditch The Carbs just released the "Ultimate Low Carb Bundle" - which includes all of their incredible ebooks and resources in one amazing package. Now I have to say (yes, a disclaimer!) that I've purchased all of these ebooks to review with my own money. Because I love them, I'm working with Ditch The Carbs as an affiliate. If you purchase through the links on this post, diaVerge will be receiving a small commission that helps support our outreach and advocacy work. For more info on what we do here at diaVerge and why, please see this post. I love all cookbooks and especially low carb cookbooks. As I've moved around a lot, I really appreciate ebooks because it doesn't matter where you are in the world. They're accessible to all - IMMEDIATELY! CLICK HERE to check out the bundle and use discount code 3DAY30, which is only valid for the next 3 days and will give you an amazing 30% off - which brings the bundled price from $27 USD to only $18.90 for the ENTIRE BUNDLE!! I've purchased these ebooks separately with my own money (and I also purchase them to send to my coaching clients as a gift) and I've spent more than $36.00 to buy them all separately. This is a great opportunity to get these really well-done ebooks for less than half the standard price. Go buy this Ultimate Low Carb Bundle from Ditch the Carbs! Thanks for being here! Make it a great Friday, everyone! Are you feeling stuck where you're at right now? Maybe you need some guidance and support while starting the low carb lifestyle. Maybe you're already following low carb but your results aren't quite where you want them to be. Please visit the diaVerge site to see how you can receive personalized 1-on-1 support and guidance to help you feel your best and lead a happier, healthier life with diabetes.